A 50-year-old man, Alhaji Isah Ibrahim, on Friday said he makes an average sale of N150,000 daily which is equivalent to N4.5 million monthly from sale of Fura da Nono in Kaduna. Isah who runs Jalla Babbar Hausa Fura da Nono, located on Lokoja road, Rigasa area of Kaduna made the disclosure in an interview with the News Agency of Nigeria (NAN). 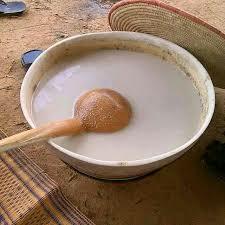 NAN reports that Fura da Nono is a drink served as meal in the Northern part of Nigeria and it’s made from fermented cow milk and grounded millet. He said that he started the business 10 years ago with a capital of N150,000 where he bought all the necessary ingredients needed in making the delicacy. “I started with a capital of N150,000 with which I bought sugar, Nono (cow milk), ice block, blender, milk and yoghurt. “We make more sales during heat season, we sell 500 litres of Nono daily which is equivalent to 150,000; we buy high quality Nono from miIk companies and the Fura is made by my wife”, he said. Ibrahim said though he is not a Fulani man, the tribe known for the business, he learnt the business and modified it. Ibrahim, a secondary school leaver, said he has engaged six young men who are working under him, while his life has been transformed, owning a house and taking care of his responsibilities without hassles. He called on youths to get something doing that would earn them a living and stop waiting and relying on government for everything.